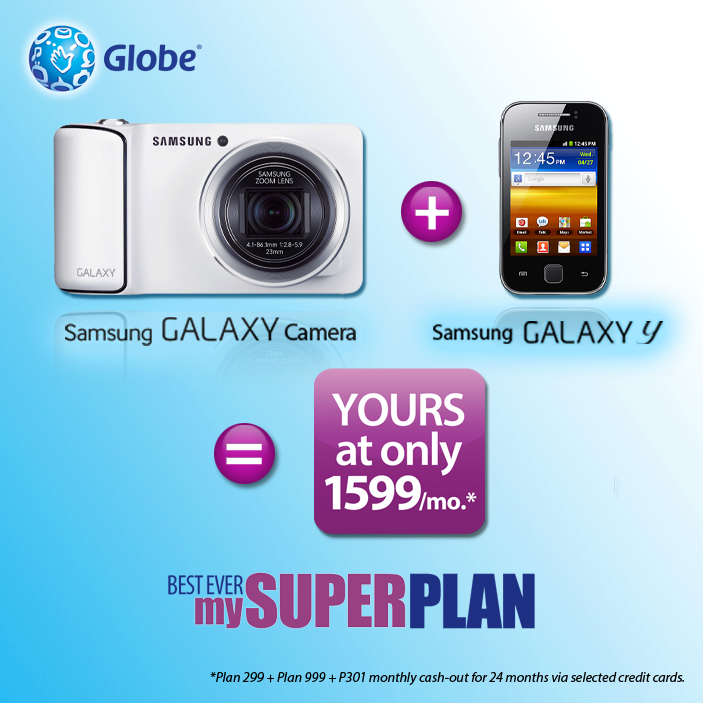 Globe Telecom offers two gadgets from their award winning best ever mySuperPlan. 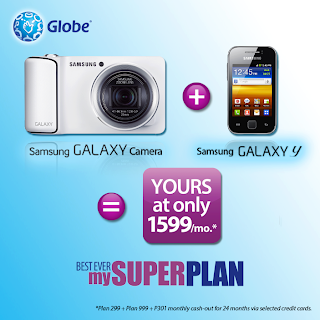 You can own a Samsung Galaxy Camera and Galaxy for only 1599 pesos on Globe plan. Using mySuperPlan you can create a flexible plan for these two bundled gadgets. Just an additional info for you guys, Globe also offers Samsung Galaxy S4 and Galaxy S3 Mini under Postpaid Plan. You can check both of that post if like to own one those gadgets. If you’re looking for a camera and a partner smartphone you can grab this offer only from Globe. Not just that, you can also decide what combo promos you want to add using the peso value for this plan. From unlimited surfing, calls and text, IDD calls, MB browsing and more, you can choose any of that every month. Samsung Camera specs are not specified on their flyer but for Samsung Galaxy Y it runs on Android Gingerbread OS with Wi-Fi and 3G connectivity. You can make use of Galaxy Y 3G connectivity when you avail monthly surfing combos. You can visit any nearest Globe Store or call their hotline: (02)730-1010 via landline and mobile for more details about this Plan.